When transporting bicycles, ensuring the safety of the passengers is paramount. Take care handling the bicycle - there is a risk of damaging the vehicle. Remove the rollable luggage compartment cover » page 72; if necessary we recommend you remove the net partition » page 75. Remove the head rests from the rear seat rests and fold the rear seats forward » page 67. 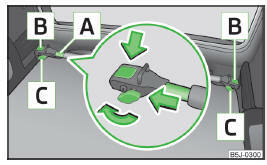 Undo the securing screws C » Fig. 73 and remove a little to unlock the retainers B . Place the cross member A with the fixed part onto the left lashing eye and then place it on the right lashing eye with the removable part of the cross member A . Press the holders B until they latch. Tighten the securing screws C .
Check how well the cross member is fastened by pulling on it. Position the approved bicycle carrier on the cross member. Remove bolt A » Fig. 74 a little and push the frame side rail (aluminium part) towards the cross member until the socket latches. Insert the screw A into the nut. 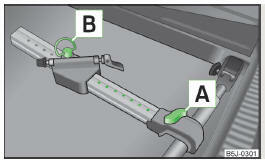 Undo the screw B on the movable part of the bicycle carrier and unscrew. Place the movable part of the fixture, depending on the size of the vehicle, in one of the possible positions so that the bicycle does not touch the boot lid. We recommend to place the moveable part of the fixture in such a position that 7 holes are visible between the screw A and the moveable part. Insert the screw B into the desired position and tighten. Remove the front wheel of the bicycle before installing it. Slacken the quick tension jack on the fixing axle of the bicycle carrier and adjust according to the width of the bicycle fork. Place the bicycle fork on the fixing axle and tighten with the quick release lever » Fig. 75 -A. Position the left pedal of the bicycle forward, in order to attach the front wheel more easily. Undo bolt A » Fig. 74 on page 76 and push the bicycle carrier to the left together with the mounted bicycle to prevent a collision between the handlebars and the side window of the luggage compartment. Carefully guide the boot lid downwards without letting go of it. Check whether there is sufficient room between the steering bars and the rear window. If necessary, adjust the position of the movable part of the bicycle carrier to prevent a collision » page 76. It is best to store the removed front wheel between the left crank and the bicycle frame, attach it with a strap to the front fork » Fig. 75 - B or to one of the fixing points. The second carrier is installed and the bicycle is secured in a similar way. To slacken the rubber part of the clamp, push both parts against each other and open the clamp. Position the clamp with the rubber part to the front (in direction of travel) as low down on the seat post as possible and lock it » Fig. 76 - A. When transporting two bicycles, stretch the belt » Fig. 76 - B between the saddles by moving the bicycles apart. Hook the carabiners on the ends of the belt into the lashing eyes behind the rear seats » Fig. 76 - A. Pull the belt through the tensioning clasps on both sides in turn. If necessary, you can correct the position of the bicycles in the vehicle.